Timothy Findley’s flight of fancy views Elizabeth I and Shakespeare’s players through a very modern lens. Canadian playwright Timothy Findley’s flight of fancy imagines Queen Elizabeth I on the eve of the execution of the Earl of Essex. To distract herself from the impending death of the man Findley firmly establishes as her lover, Elizabeth commands a performance by the Lord Chamberlain’s Men of Much Ado About Nothing. 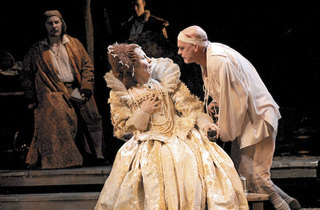 Yet the bulk of Findley’s play takes place not in the palace but in the queen’s barn, where Shakespeare and his actors are put up for the night and where the queen pays them an unlikely visit. There, Elizabeth is particularly taken by the actor Ned Lowenscroft, who specializes in Shakespeare’s female roles. Ned, who’s dying of the syphilitic “pox” he contracted from a male lover, challenges the queen to find her feminine heart, while she dares him to face his death like a man. 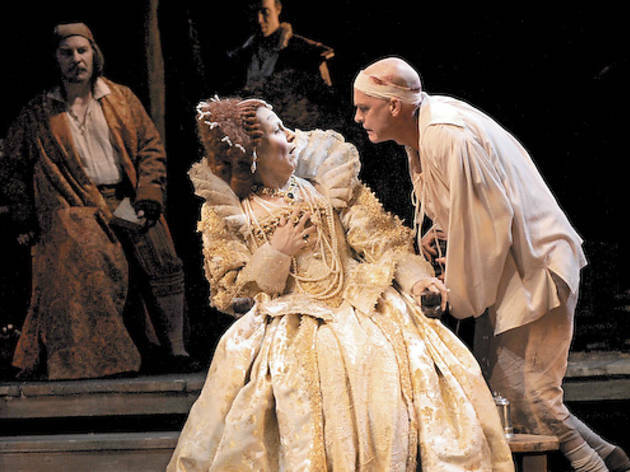 Elizabeth Rex, which premiered at the Stratford Shakespeare Festival in 2000, has a strong bent toward presentism, particularly in its obsession with gender roles. The particulars of Ned’s love life are treated by both his fellow actors and the queen as relatively unremarkable topics of conversation—a notion that feels as questionable as Elizabeth’s slumming. But Findley does provide meaty roles, and Barbara Gaines’s cast rips into them with relish. Steven Sutcliffe’s bitter, self-tragedizing Ned makes a fine match for Diane D’Aquila’s Elizabeth, alternately imperious and earthy, even if the script steers them into camp by the second-act climax, when Ned engages Elizabeth in primitive drama therapy.